Berry R.E, Armstrong E.M., Beddoes R.L., Collinson D., Ertok S.N., Helliwell M., Garner C.D. 1999. The structural characterization of Amavadin. Angewandte Chemie, International Edition 38: 795-795. Borovička J., Kotrba P., Gryndler M. 2008. Silver accumulation in macrofungi. [Abstract] Geochimica et Cosmochimica Acta 72 (12S): A99. Borovička J., Kotrba P., Gryndler M., Mihaljevič M., Řanda Z., Rohovec J., Cajthaml T., Stijve T., Dunn C.E. . 2010. Bioaccumulation of silver in ectomycorrhizal and saprobic macrofungi from pristine and polluted areas. Science of the Total Environment, in review. Borovička J., Řanda Z., Jelínek E., Kotrba P., Dunn C.E. 2007. Hyperaccumulation of silver by Amanita strobiliformis and related species of the section Lepidella. Mycological Research 111: 1339-1344. Byrne A.R., Š lejkovec Z., Stijve T., Fay L., Gössler W., Gailer J., Irgolic K.J. 1995. Arsenobetaine and other arsenic species in mushrooms. Applied Organometallic Chemistry 9: 305-313. Gadd G.M. 2004. Mycotransformation of organic and inorganic substrates. Mycologist 18 (2): 60-70. Gadd G.M. 2007. Geomycology: biogeochemical transformations of rocks, minerals, metals and radionuclides by fungi, bioweathering and bioremediation. Mycol. Res. 111: 3-49. Hedrich E. 1988. Short-time activation analysis of some Austrian mushrooms. Journal of Trace and Microprobe Techniques 6 (4): 583-602. Kneifel H., Bayer E. 1986. Stereochemistry and total synthesis of amavadin, the naturally occurring vanadium anion of Amanita muscaria. Journal of the American Chemical Society 108: 3075–3077. Koch E., Kneifel H., Bayer E. 1987. Das Vorkommen von Amavadin in Pilzen der Gattung Amanita. Zeitschrift für Naturforschung 42c: 873-878. Kotrba P., Urban V., Jedelský P.L., Borovička J., Daniel O., Macek T., Ruml T. 2009. On metalloresistance in silver hyperaccumulating Amanita strobiliformis. 34th FEBS Congress, Prague. FEBS Journal 2009, 276(s1), 281-282. ISSN 00142956, IF 3.139. Kuehnelt D., Gössler W., Irgolic K.J. . 1997a. Arsenic compounds in terrestrial organisms I: Collybia maculata, Collybia butyrace and Amanita muscaria from arsenic smelter sites in Austria. Applied Organometallic Chemistry 11: 289-296. Kuehnelt D., Gössler W., Irgolic K.J. . 1997b. Arsenic compounds in terrestrial organisms II: Arsenocholine in the mushroom Amanita muscaria. Applied Organometallic Chemistry 11: 459-470. Meisch H.-U., Schmitt J.A., Reinle W. 1978. Schwermetalle in höheren Pilzen, III. Vanadium und Molybdän. Zeitschrift für Naturforschung 33c: 1-6. Michelot D., Melendez-Howell L. M. 2003. 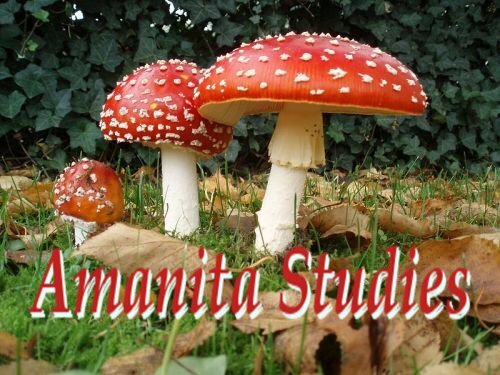 Amanita muscaria: chemistry, biology, toxicology and ethnomycology. Mycological Research 107 (2): 131-146. Osobová, M., Urban, V., Jedelský, P. L. , Borovička, J., Gryndler, M., Ruml, T. and Kotrba, P. 2011. Three metallothionein isoforms and sequestration of intracellular silver in the hyperaccumulator Amanita strobiliformis. New Phytologist 190: 916-926. Řanda Z., Kučera J. 2004. Trace elements in higher fungi (mushrooms) determined by activation analysis. Journal of Radioanalytical and Nuclear Chemistry 259 (1): 99-107. Řanda Z., Kučera J. 2005. Possibilities of the short-term thermal and epithermal neutron activation for analysis of macromycetes (mushrooms). Journal of Radioanalytical and Nuclear Chemistry 264 (1): 67-76. Řanda Z., Soukal L., Mizera J. 2005a. Possibilities of the short-term thermal and epithermal neutron activation for analysis of macromycetes (mushrooms). Journal of Radioanalytical and Nuclear Chemistry 264 (1): 67-76. Rehder D. 1992. Structure and function of vanadium compounds in living organisms. BioMetals 5: 3-12. Schmitt J.A., Meisch H.-U., Reinle W. 1978. Schwermetalle in höheren Pilzen, IV. Silber. Zeitschrift für Naturforschung 33c: 608-615. Stijve T. 1984. Inorganic bromide in higher fungi. Zeitschrift für Naturforschung 39c: 863-866. Stijve T. 1985. Inorganic bromide - a simple method for the confirmation of residue identity. Deutsche Lebensmittel-Rundschau 81 (10): 321-322. Stijve T. 1997. Teneur en chlorures et bromures des champignons superieurs. Bulletin de l’Observatoire Mycologique n° 12: 32-39. Stijve T., Bourqui B. 1991. Arsenic in edible mushrooms. Deutsche Lebensmittel- Rundschau 87 (10): 307-310. Stijve T., Diserens H., Oberson J.M., Meijer A.A.R. 1994. The natural inorganic bromide content of edible mushrooms. Deutsche Lebesmittel Rundschau 94 (4): 112-117. Stijve T., Vellinga E.C., Herrmann A. 1990. Arsenic accumulation in some higher fungi. Persoonia 14 (2): 161-166. Urban V., Borovička J., Jedelský P. L., Randa Z., Macek T., Ruml T., Kotrba P. 2008a. Cysteine-rich peptides are responsible for intracellular sequestration of silver in silver-hyperaccumulating fungus Amanita strobiliformis. Book of Abstracts of 4th European Bioremediation Conference, pp. 268. Chania, Greece. ISBN 978-960-8475-12-0. Urban V., Ruml T., Borovička J., Jedelský P. L. Gryndler M., Macek T., Kotrba P. . 2008b. Silver hyperaccumulating Amanita species. [Abstract] Journal of Biotechnology 136S: S54-S55. Vetter J. 2005. Mineral composition of basidiomes of Amanita species. Mycological Research 109: 746-750. Borovička J., Řanda Z., Jelínek E., Kotrba P., Dunn C.E. (2007): Hyperaccumulation of silver by Amanita strobiliformis and related species of the section Lepidella. Mycological Research 111: 1339-1344. Borovička J., Kotrba P., Gryndler M. (2008): Silver accumulation in macrofungi. [Abstract] Geochimica et Cosmochimica Acta 72 (12S): A99. Borovička J., Kotrba P., Gryndler M., Mihaljevič M., Řanda Z., Rohovec J., Cajthaml T., Stijve T., Dunn C.E. (2010): Bioaccumulation of silver in ectomycorrhizal and saprobic macrofungi from pristine and polluted areas. Science of the Total Environment, in review. Gadd G.M. (2004): Mycotransformation of organic and inorganic substrates. Mycologist 18 (2): 60-70. Gadd G.M. (2007): Geomycology: biogeochemical transformations of rocks, minerals, metals and radionuclides by fungi, bioweathering and bioremediation. Mycol. Res. 111: 3-49. Hedrich E. (1988): Short-time activation analysis of some Austrian mushrooms. Journal of Trace and Microprobe Techniques 6 (4): 583-602. Kneifel H., Bayer E. (1986): Stereochemistry and total synthesis of amavadin, the naturally occurring vanadium anion of Amanita muscaria. Journal of the American Chemical Society 108: 3075–3077. Koch E., Kneifel H., Bayer E. (1987): Das Vorkommen von Amavadin in Pilzen der Gattung Amanita. Zeitschrift für Naturforschung 42c: 873-878. Kuehnelt D., Goessler W., Irgolic K.J. (1997): Arsenic compounds in terrestrial organisms I: Collybia maculata, Collybia butyrace and Amanita muscaria from arsenic smelter sites in Austria. Applied Organometallic Chemistry 11: 289-296. Kuehnelt D., Gössler W., Irgolic K.J. (1997a): Arsenic compounds in terrestrial organisms II: Arsenocholine in the mushroom Amanita muscaria. Applied Organometallic Chemistry 11: 459-470. Meisch H.-U., Schmitt J.A., Reinle W. (1978): Schwermetalle in höheren Pilzen, III. Vanadium und Molybdän. Zeitschrift für Naturforschung 33c: 1-6. Řanda Z., Kučera J. (2004): Trace elements in higher fungi (mushrooms) determined by activation analysis. Journal of Radioanalytical and Nuclear Chemistry 259 (1): 99-107. Řanda Z., Soukal L., Mizera J. (2005): Possibilities of the short-term thermal and epithermal neutron activation for analysis of macromycetes (mushrooms). Journal of Radioanalytical and Nuclear Chemistry 264 (1): 67-76. Rehder D. (1992): Structure and function of vanadium compounds in living organisms. BioMetals 5: 3-12. Schmitt J.A., Meisch H.-U., Reinle W. (1978): Schwermetalle in höheren Pilzen, IV. Silber. Zeitschrift für Naturforschung 33c: 608-615. Stijve T. (1997b): Teneur en chlorures et bromures des champignons superieurs. Bulletin de l’Observatoire Mycologique n° 12: 32-39. Stijve T., Diserens H., Oberson J.M., Meijer A.A.R. (1994): The natural inorganic bromide content of edible mushrooms. Deutsche Lebesmittel Rundschau 94 (4): 112-117. Stijve T. (1984): Inorganic bromide in higher fungi. Zeitschrift für Naturforschung 39c: 863-866. Stijve T. (1985): Inorganic bromide – a simple method for the confirmation of residue identity. Deutsche Lebensmittel-Rundschau 81 (10): 321-322. Urban V., Ruml T., Borovička J., Jedelský P. L. Gryndler M., Macek T., Kotrba P. (2008b): Silver hyperaccumulating Amanita species. [Abstract] Journal of Biotechnology 136S: S54-S55. Vetter J. (2005): Mineral composition of basidiomes of Amanita species. Mycological Research 109: 746-750.